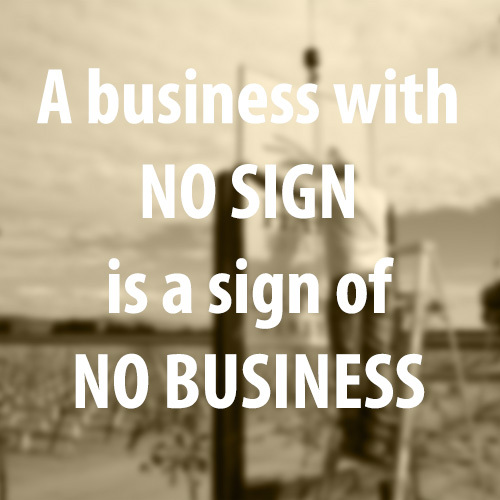 It has been said time and time again, “A business with no sign is a sign of no business”. This popular quote simply conveys the message that businesses must advertise in some form. People will not come to or support your establishment if they do not know your company is there. For a storefront or brick and mortar operation, an effective business sign is the key to getting those customers flowing through the door and getting your phone to ring. First impressions are important but lasting impressions are everything. When you begin the process of brainstorming your sign, plan carefully. Here are some key elements about your business sign that you should consider. Considering the fact that this sign may display for decades, the design should be well thought and well planned. It is estimated that consumers will have the opportunity to see your establishment at least twice per day. This gives you a great advantage already to attract customers. Of course it has to have your personal touch but your sign needs to convey a message quickly rather than summarize who you are. Photos need to be displayed in a manner that is eye-catching, bold and interesting. Make sure your colors complement your business and building itself. You don’t want to just make a sign with your favorite colors. You also don’t want a sign that is so colorful that it is distracting. Your theme should be simple yet complex enough to last throughout many years. A verbose sign usually will not get the attention that it needs. A potential customer whether driving or walking will need to read your message clearly and concisely within a matter of seconds. Usually drivers need less than five seconds to read and comprehend what they are reading. Too many words can be distracting and make the reader lose interest. Your sign should say who you are and what you are. You should consider adding the company phone number on another prominent place. If you don’t have a spot such as a front door, panel or window, consider adding it to the actual business sign. This should only be done if it is necessary for customers to reach you when your establishment is closed. In regards to your sign, you should literally choose your words wisely. If your company or brand has a logo already developed, this can play a key role in creating an effective sign. The logo must also use some of the above characteristics in order to be effective. You want people to easily gather the information that they need so that they can decide on whether or not to support your establishment. Your sign can be used as an advertising tool to promote your brand. Create a sign that is consistent in design aspects, themes, and colors of your other promotional material. This will create an identity for your company. When potential customers see ads from any of your marketing campaigns, they will remember your sign. In essence, visual advertising all comes back to your brand identity. The logo, business sign, flyers, online ads, business cards, and such are all connected visually. Your business sign must be effective in conveying the same message as any other promotional material that you distribute whether traditional or online. Your business sign should make potential clients take a second glance, creating a tiny but permanent mark that will allow them to remember what they saw when the time comes for them to knock on your door. For information on our Custom Sign Services, please give Signs by Van a call at 831-663-2663 or visit our contact page here.